Hollybeary Creations : NND January Release Day 3! NND January Release Day 3! It's Day 3 of the January Release Hop with Newton's Nook Designs. Today we are introducing... Love - Owl-ways and it's coordinating die set. If you missed the other days be sure to check them out for a chance to Win a set each day! I created a background for my card with some Distress Ink and then I added some Clouds with the Cloud Sky stencil and some White embossing paste. I stamped the sentiment right over the clouds when they were dry with some VersaFine ink. Then I trimmed a 1/4" off the side and adhered it to a White card base with some Washi tape along the side. Then I stamped the images onto some Copic friendly paper and colored them in with Copics. I used the coordinating dies to trim them out and added details with a White gel pen. These owls are a must have for your collection! 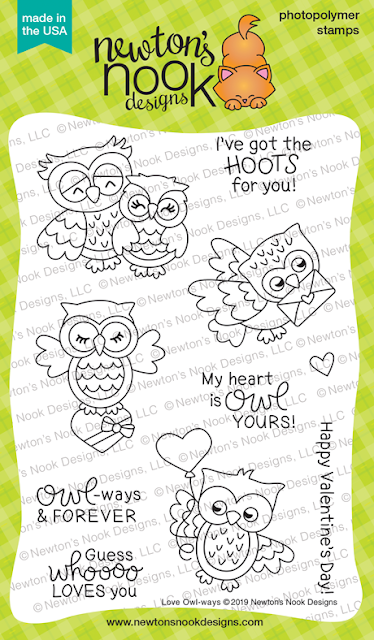 Would you like to win the “ Love Owl-ways ” Stamp Set? Love the background, your owls are too cute! I love the cloud background and how you colored the owls! So cute! I love your coloring and your scene is so perfect! This is so cute! I love how the one owl is looking at the other one! I know he wants that candy heart! LOL! Such a darling card. What is copic friendly paper may I ask? I guess I didn't honestly know that there was such a thing. Still a beginner but hope to change that this year! Looking forward to your 2019 posts! Love the textured clouds and the way you colored the owls! Adorable card! Cute sky scene with these owls. I like the clouds. Loved the texture of the back ground and the airy look it gives! Great dimension added with the clouds, truly creates a scene to let the owls shine! I love your cloud background and the way you anchored everything with the washi tape. Very cute card ...love the owls and the cloud stencil. Really cute card! Love the coloring on those adorable owls! Love the owls! These are adorable. Could make a ton of cards for my friend who is CRAZY about owls! Owl always love this card. Cute use of the owls. I just love the way you did the background with the embossing paste!!! I'm going to try this! So cute. Love the cloud background. Your owl card is super adorable! I love how you made the clouds and I love how you colored the owls. Love your darling little owls.